Even Captain Phasma has to tap. Photo by Steve Hymon/Metro. Things to read whilst transiting: “How George Lucas spliced together Westerns, jidaigeki, space adventure serials, fairy tales, dogfighting movies, and Casablanca to create Hollywood’s first world-conquering collage,” in Slate. By “spliced” they really mean lifted ideas, scenes, particular shots and dialogue from earlier films. Related 1: I saw “Force Awakens” last night. In the spirit of keeping one’s piehole clamped tightly shut about spoilers, I will only say that I’m already looking forward to Episode VIII on Memorial Day weekend in 2017. Related 2: my colleague Joe has posted a good list of movie theaters near the Metro Rail system. Related 3: Imagine how good the prequels could have been if Lucas had cared enough to bring in skilled screenwriters and directors. Sigh. The Expo Line along Flower Street south of DTLA. Photo: Steve Hymon/Metro. Good video of the L.A. Councilmember who represents the ‘Pedro taking the new Silver Line extension to work. Lots of good comments and a cameo from Metro’s Scott Page, who works in bus planning and scheduling. Thank goodness; the corner of Olympic and Figueroa is not the right place for a car wash, parking lot or other car-centric use. Sounds like a big building will be sought, featuring “feature 374 residential units, a 373-key hotel, nearly 33,5000 square feet of commercial office space, an approximately 10,800-square-foot conference center and over 65,000 square feet of commercial space,” according to Urbanize. 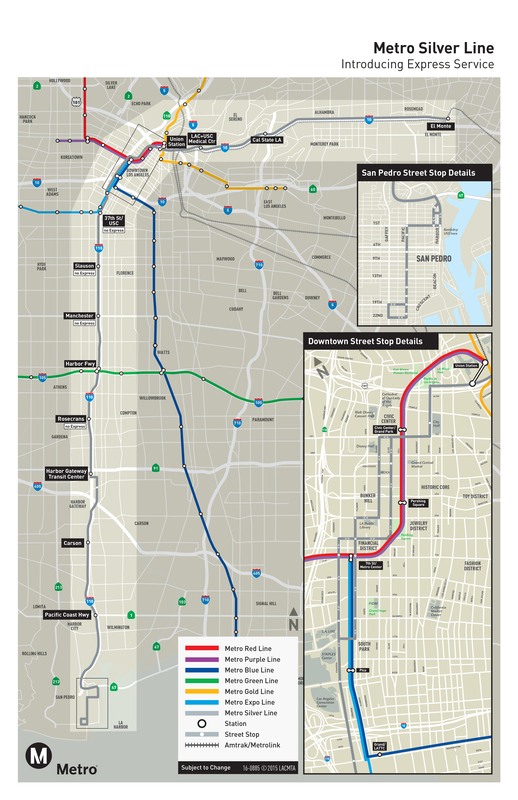 The new building would be a short walk from the Metro Rail hub at 7th/Metro, the Blue and Expo Lines’ Pico Station, the Silver Line and numerous other buses operated by Metro and other muni agencies. There was understandably lots of news coverage of the Chargers and Rams both possibly playing their last games in San Diego and St. Louis this past weekend. This LAT story is older but looks at a key question: where exactly will the Chargers, Rams or Raiders (the other L.A. candidate) play if NFL owners decide in January to allow one or two teams to move here? 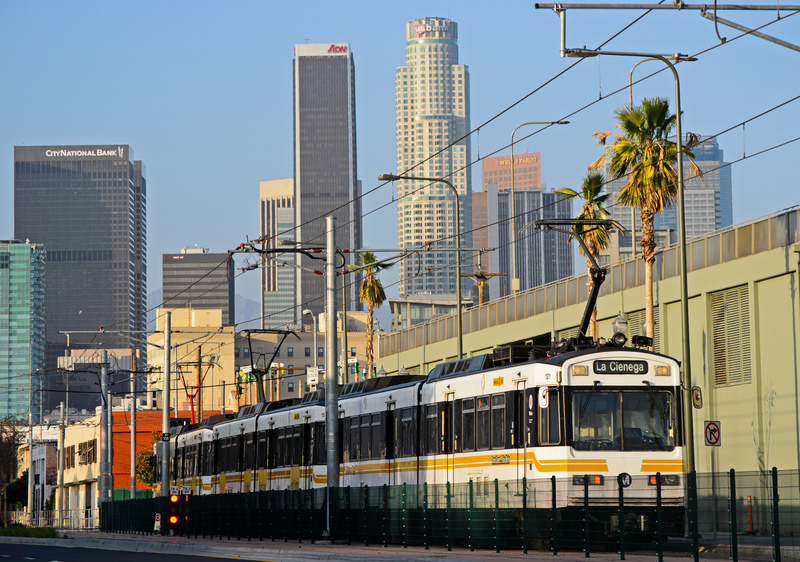 The answer is probably the Expo Line-friendly L.A. Coliseum, but apparently Angel Stadium in Anaheim and Dodger Stadium could be possible venues. Angel Stadium has Metrolink service and Dodger Stadium, of course, is serviced for baseball and some concerts by the Dodger Stadium Express. We’ll see what happens if an NFL team moves there. Unfortunately, the longer-term stadiums for possible NFL teams don’t look as encouraging. The Chargers and Raiders want to build a ballpark on a 405-adjacent parcel in Carson that’s nowhere near Metro Rail. The Rams are hoping to build a stadium on the Hollywood Park site in Inglewood, about a mile walk from the future Crenshaw/LAX Line. The FAA has raised some concerns about that site, but it strikes me as having a slightly better shot given the long history of the racetrack and the Forum in Inglewood. One other possibility, Charger fans: Mike Florio of NBC says one long-shot is for the owners of the Chargers and Rams to swap teams, thereby allowing the Chargers to move to Inglewood and the Rams to remain in St. Louis. Good observations about the irony of transit agencies putting a ton of buses on the road at rush hour and those buses often running way behind schedule because they’re stuck in traffic. (1) Congestion is already bad enough as it is at rush hour on streets like Santa Monica. How much worse can it get? (2) Cars don’t have to pull over and wait for passengers to board every few blocks the way buses do, giving them a natural advantage under the same traffic conditions. And (3) Cars can always use Waze to meander through side streets when traffic gets bad on arterials. Buses have to stick tho their arterial routes through thick and thin. (at least until intelligent technology allows for on-demand scheduling). My slight hunch is that installing those bus lanes won’t exactly be a slam dunk and that motorists will have their rebuttals to 1, 2 and 3 above. That means that politicians will ultimately have to choose between bus riders and motorists. Observation: from the beginning of time until the present, I’d say motorists have largely won that battle, eh? I certainly like it when government chooses to be interesting rather than boring. @stevehymon, hopefully motorists will buckle up without need of references to a fantasy galaxy or the #Force or… maybe we're #trekkies. Dec. 18: buses versus illegal motorists in the Wilshire peak hour bus lanes. 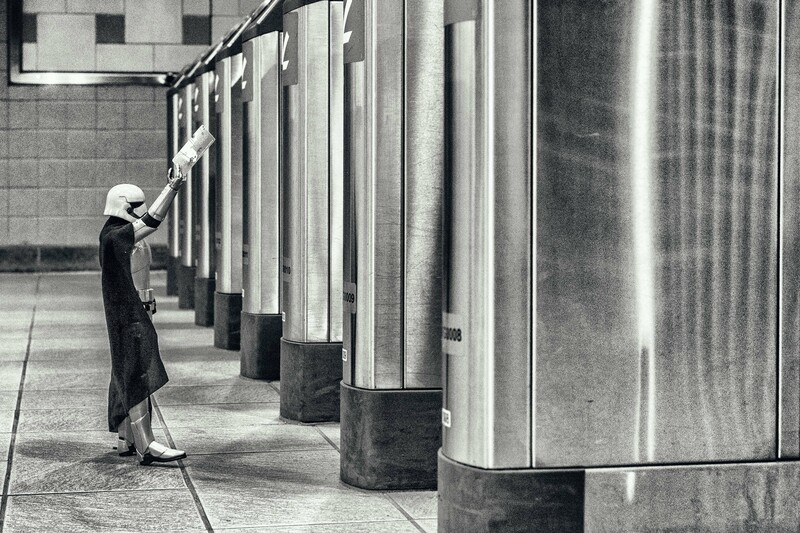 Dec. 15: more on the Metro bus service changes that began last Sunday. Dec. 14: how will the Paris climate deal change our everyday lives in L.A. County? Dec. 11: will we ever have a truly car-free city? Dec. 10: hey, so when is the Expo Line to SaMo opening? Looks like quite a few people on the Buscaino Facebook post want to take it to and from events at Staples Center – except they can’t since the last Silver Line bus leaves Downtown for San Pedro in the 8 o’clock hour. Identifying the alternate service, which is the Line 246 local bus to San Pedro or the 205/550 for the Carson St and PCH stops, would help. The Santa Monica Lookout article links to the wrong page. Hmm. Looks like one could catch the San Pedro Red Car from the Silver Line. IF the service ever gets reinstated. As to the lack of night through service to San Pedro (which would also be useful for San Pedro residents going to Disney Hall, the Music Center, or the Bowl), give it some time. And some pressure. The service is still young. As to an NFL team in Los Angeles, I continue to assert that football is entirely too much fuss over a lousy 25 cents (i.e., they start with a coin-toss, then spend the rest of the game trying to “get the quarter back”)! What? Cars weren’t around in the 1700s? I think I may have intended to be sarcastic as a way of pointing out that political decisions often favor motorists across the U.S. — a point that I suspect Streetsblog agrees with. The War On Pedestrians started in the 1920s. The speed-demon kill-em-all motorists seemed to have won by the 1950s. But now London (UK) has lots of bus lanes. And Chicago finally started installing bus lanes. So maybe there’s hope. On the stadium issue, the distance from the proposed Carson stadium to the new Silver Line route is about the same as that from the Inglewood station to the proposed Inglewood stadium. Add a stop at Figueroa and Del Amo and it is fairly convenient.